How Does a Rocking Bed Help People With Sleep Disorders? 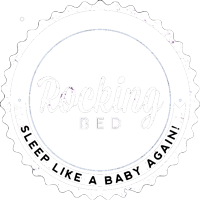 A rocking bed or bassinet has long been a go-to solution for helping babies and young children get their sleep. The gentle rocking motion is soothing and relaxing, helping even the fussiest of children fall asleep quickly and peacefully. What you may not know is that rocking beds aren’t just for children. In fact, science suggests that rocking beds may be just what adults need in a world where the average person gets an hour less sleep each night than their parents and grandparents did, and about 70 percent of people struggle to fall asleep at least once per week. To find out more, let’s take a look at a few of the reasons why rocking beds may be just what the sleep doctor ordered. If you struggle with insomnia or another sleep disorder, you’re probably desperate for any solution to help you fall asleep and stay asleep. The gentle rocking motion provided by a rocking bed may be just what you need, reducing the time it takes for you to fall asleep and allowing you to get a deeper, more restful night of sleep. Studies have also suggested that rocking beds may be useful in addressing sleep fragmentation, which is the inability to stay asleep for long periods. Even if you’re able to fall asleep quickly at night, you aren’t getting the rest and recovery you need if you can’t stay asleep for prolonged periods. Proper, high-quality sleep is essential to your physical and mental well-being, but it’s harder to come by than ever before. Whether you suffer from a sleep disorder or you simply don’t feel as rested at night as you should, there’s no need to turn to addictive sleep medications or high-priced gadgets. Science suggests the gentle, tranquil motion of a rocking bed may be just what you need to sleep like a baby. So how does a rocking bed help people with sleep disorders? The average person’s sleep habits are poorer than they’ve ever been. While this may not sound like grave news, the implications are serious indeed. A short-term lack of sleep can leave you feeling drowsy, unmotivated and potentially prone to accidents and mistakes. Over the longer term, chronic sleep deprivation may contribute to conditions as serious and diverse as depression, obesity, heart disease, and other cardiovascular risks weakened immunity, diabetes, memory problems and more. In other words, getting proper sleep isn’t just a matter of comfort: it could have a serious impact on your health and well-being. So, how does a rocking bed address this issue? Though the details vary, the basic mechanics behind an adult rocking bed are quite simple. Using hardware that attaches to your existing bed in place of a box spring, a rocking bed uses electric motors to create a gentle rocking motion throughout the night. The motors are designed to be quiet, generating only a subtle white noise that actually helps many people fall asleep even faster. The motors can typically be operated by simple controllers to set the desired speed and motion, providing a comfortable and customized experience. The connection between gentle rocking and sleep has long been acknowledged in children, but it wasn’t until recently that scientists have explored the potential link in adults. A landmark 2011 study was the first to show that gentle rocking encourages the transition from a waking state to a sleeping state in adults, significantly speeding the onset of sleep in the study’s participants. Rocking also led to more restful sleep, extending the period of time that subjects spent in the deepest, most rejuvenating stages of sleep compared to sleeping in a motionless bed. In fact, the scientists behind the study have suggested that rocking beds could even be used in aiding stroke victims in their recovery. Previous PostHow Does The “Rocking Bed For Adults” Work? How Does The “Rocking Bed For Adults” Work?